This post has been updated from the previous one located here. I left the previous post up so that anyone interested in changes over time can see the previous results. There are about 50 more profs in the network now. Interestingly, in just the past few days the structure of the law prof twitter network has become somewhat more dense (perhaps partially as a result of law profs viewing the previous post). I have omitted solo nodes with no connections to the network. I wrote a short script to read all of the law prof twitter handles included in the census (along with a few provided by others individually) and query the twitter API to get the follower lists and statistics for each user. This allowed me to both rank law prof twitterers (because we all know how much people like to rank things) and project them onto an interactive network so we can see how they relate to one another. To view the network, click through the image below. 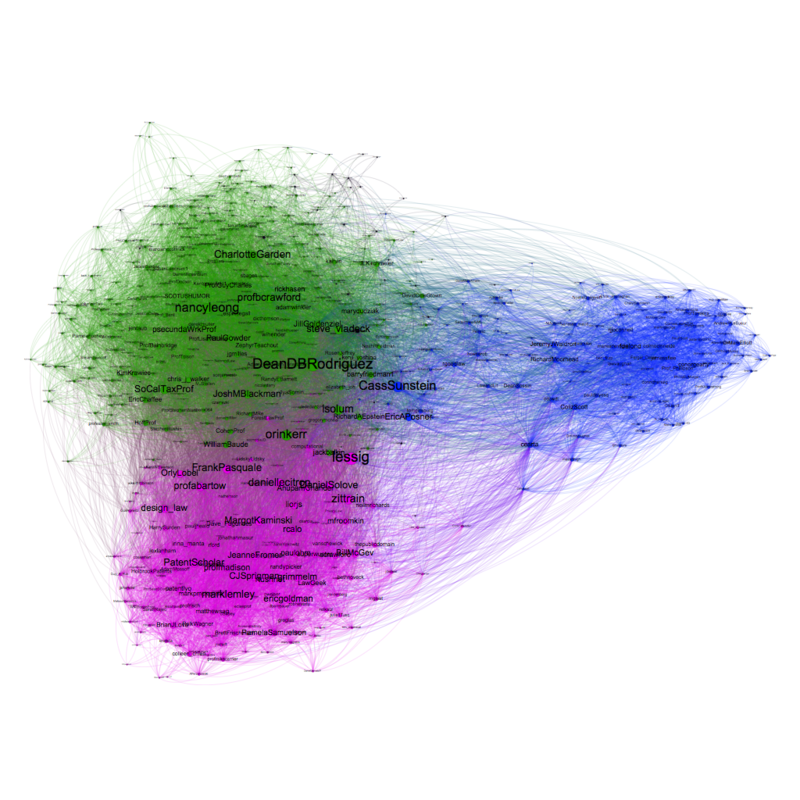 The law prof network (consisting of following relationships amongst law profs in the census) has 583 nodes and 20709 edges (directed density = 0.061). 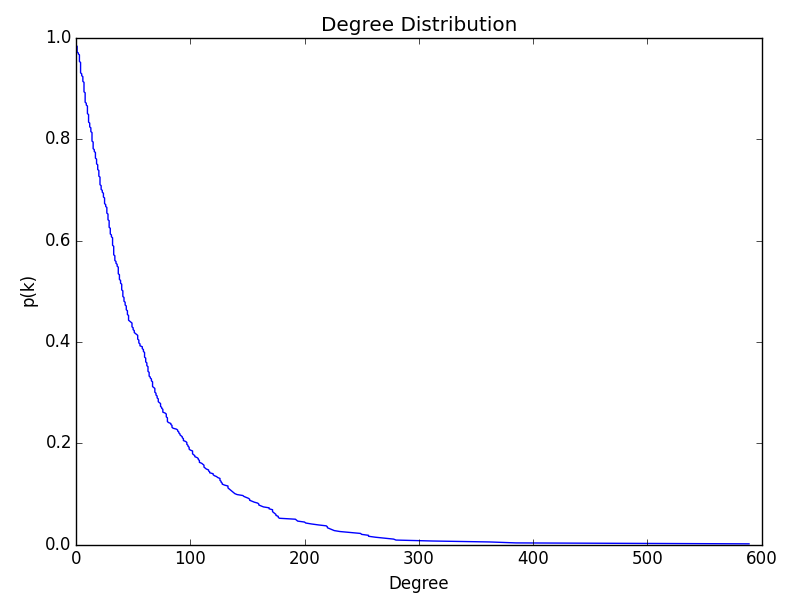 The entire network (including all of the followers of all of the law profs) is much larger. In total there are 795,399 unique twitter users who follow law profs. You’ll note that almost half of these follow Professor Lessig, who has an order of magnitude more followers than any other law prof. Colors in the network correspond to communities detected using the Louvain method. Modularity in the network is 0.336, with 4 communities and a few solo nodes/pairs. I haven’t delved much into the meaning of the clusters, but I’d be interested to hear any theories about what they might represent. Limiting our rankings to those professors who have the most followers amongst other law professors on twitter, changes the results quite a bit. Note the change here since the data was last fetched. Connections have increased pretty much across the board, and @lessig has taken the lead in this metric as well. If we group profs by school and rank them by followers, the top twenty look as below. Obviously having a twitter superstar on the faculty really boosts the ranking. Michael Geist’s inclusion in the dataset at this point puts the University of Ottawa in second place.